In a strange way, I admire Bernie Sanders. He openly embraces big government. 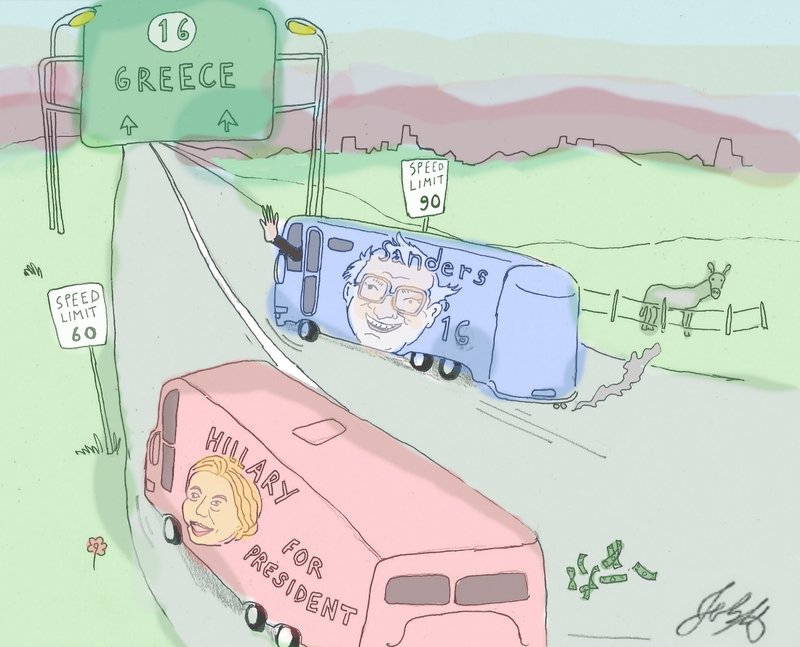 Back during the 2016 campaign, I frequently observed that the difference between the Vermont Senator and Hillary Clinton is that he wanted America to become Greece at a much faster rate. According to Sanders and other advocates, the government’s health system is a good role model: People pay a tax while working and they get health care when they’re old. But there’s a not-so-slight problem with that approach. For every dollar that Medicare recipients paid to the program, taxpayers are financing three dollars of spending. That approach is workable (though only in the short run) for Medicare. But it won’t work if government is paying for everyone’s health care. So even Bernie admits that a tax increase will be necessary. And not just any tax hike. He’s proposing the biggest tax hike in the history of the United States. Heck, it’s the biggest tax hike in world history. Here are some of the frightening details, as reported by the Washington Post. The Medicare for All legislation backed by Sen. Bernie Sanders (I-Vt.) and 16 Senate Democrats does not include details on how it might be paid for. …Sanders’s Senate office released a white paper on possible ways to pay for the legislation. He starts with a giant payroll tax of 11.5 percent (on top of the 15.3 percent payroll tax that already exists). The taxes themselves would fall on both employers and employees. Sanders floats the idea of a 7.5 percent tax on employers… Another tax, of 4 percent, would hit individuals. To understand what this means, just contemplate the disastrous impact of Obamacare on the job market. Sanders also has a big class-warfare tax hike. The next big slice of funding: higher tax rates on the very wealthy. Income…$250,000…higher…would be hit harder, on an upward sliding scale, ending at a 52 percent tax on income over $10 million. By the way, imposing a tax is the easy part. Collecting revenue will be a much harder task, especially since Sanders wants to take the very successful experiment of the 1980s and run it in reverse. He also wants a big levy on banks (foreign financial institutions are probably praying for that outcome), an extra layer of tax on American companies competing in world markets (foreign corporations are cheering for that one), along with a huge boost in the death tax and the imposition of a wealth tax (lawyers and accountants doubtlessly are licking their chops). Sanders imagines a tax on financial institutions worth more than $50 billion, a one-time tax on offshore profits (an idea that is continually floated then sunk in tax reform negotiations), a higher estate tax (topping out at 55 percent), and a 1 percent wealth tax on the richest 0.1 percent of households. That’s all the tax hikes listed in the Washington Post story, but Sanders also has some additional material on his office website. A huge increase in the double taxation of dividends and capital gains (particularly when you consider that personal tax rates will be much higher. …end the special tax break for capital gains and dividends on household income above $250,000, treating this income the same as income earned from working. A restriction on itemized deductions. …itemized deductions would be capped at 28 percent for households making over $250,000. In other words, for every dollar in tax deduction a high-income household could save at most 28 cents. For what it’s worth, I don’t like the state and local tax deduction and the charitable deduction, and I also don’t like preferences for housing. But I want to eliminate such distortions only if the revenue is used to finance lower tax rates, not to finance bigger government. That being said, let’s get back to our list. Sanders has a special tax targeting small business. …ensure that all business income of high-income people would be subject to the existing 3.8 percent tax to fund Medicare, either through the net investment income tax or the additional Medicare tax on earned income. Last but not least, he wants to skim $112 billion over 10 years from corporations by manipulating accounting rules. …eliminate the “last-in, first-out” (LIFO) accounting method. The bottom line is that Sanders, in one fell swoop, would saddle America with a European-sized government. And that would mean European-level taxes. The only thing that’s missing is he didn’t propose a value-added tax. Though I’m sure that would get added to the mix since the huge increase in the government’s fiscal burden would retard growth. And since that would mean sluggish revenue, politicians would seek another way to extract more money from the economy’s productive sector. P.S. I’m a policy wonk rather than a political tactician, but my guess is that Bernie is misreading the mood of the American people. Yes, “free” healthcare sounds nice, but people get understandably scared when they get a price tag. This is why single-payer was repealed in Bernie’s home state. And it’s why Colorado voters rejected a similar scheme by a landslide margin. Oh. When the Democrats said they wanted a single payer health care system, I thought they meant that George Soros was going to pay for my medical bills. So by “single payer” they mean “the taxpayers”, i.e. “one hundred fifty million some odd payers”. If Democrats can’t tell the difference between “1” and “150,000,000”, why do we trust them to manage … anything that involves numbers? He who defines the terms wins the argument. In this case you add the word “free”.